We are proud to announce that we will be at the computer graphics conference SIGGRAPH Asia 2018 this December, where we will present the techniques used to create our 64K intro, H – Immersion. At the conference, the “Computer Animation Festival” celebrates storytelling and animation in general, and showcases some of the best works of the year. We are honoured to have been selected among the talks there, and still in disbelief to be sitting next to talks about Pixar’s Incredibles 2 or Solo: A Star Wars Story. If you are attending SIGGRAPH Asia this December in Tokyo, come to our session on Thursday 6th of December, from 16:15 to 18:00, in room G502 (glass building, fifth floor). All the details are available on the SIGGRAPH Asia 2018 session description. There is an iCalendar file as well. Tomasz Bednarsz has been trying to increase the presence of demoscene at the major graphics community conference, SIGGRAPH, for a few years now, through so called “Birds of a Feather” sessions. 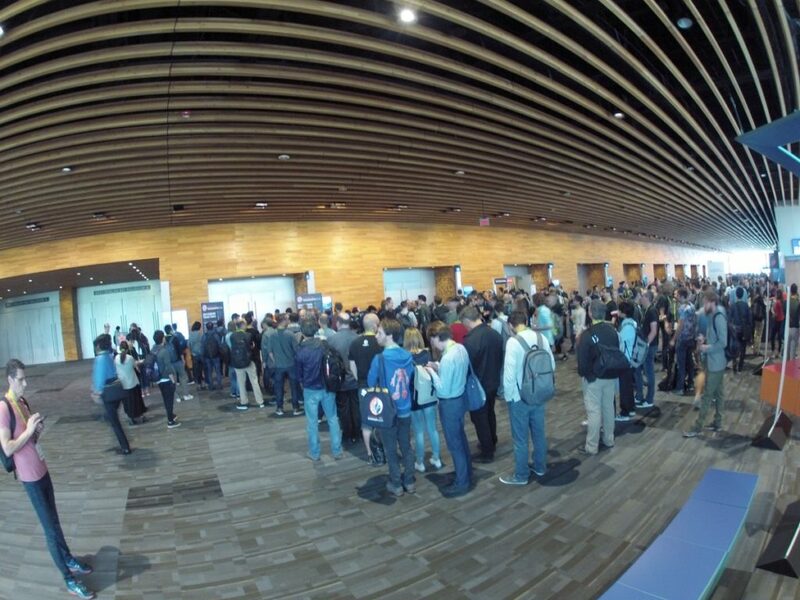 This year I had the unexpected opportunity to attend SIGGRAPH in Vancouver, and I was invited to participate to the session along with a few other sceners. The details are available on the description that Tomasz posted. Making an animation 18 bytes at a time. A recording of the entire session is available. It includes the introduction by Tomasz, a presentation of a technique to render clouds in real time by Matt Swoboda (Smash, of Fairlight), our part, another take on 64k creation by Yohann Korndörfer (cupe of Mercury), and a presentation of Tokyo Demo Fest by Kentaro Oku (Kioku, of SystemK). The event was way more successful than any of us expected, and we were all gladly surprised to see so much interest from the graphics community. A lot more people showed up than the room could accommodate, meaning that unfortunately most of them had to walk away. The waiting line for the Birds of a Feather session on demoscene, at SIGGRAPH 2018. Hopefully this increased interest means we can expect more events like this to happen at SIGGRAPH in the future years. We are already planning to do another demoscene session at SIGGRAPH Asia 2018, which will take place in Tokyo on December 4th to 7th. This article is the second part of our series on the making of H – Immersion. 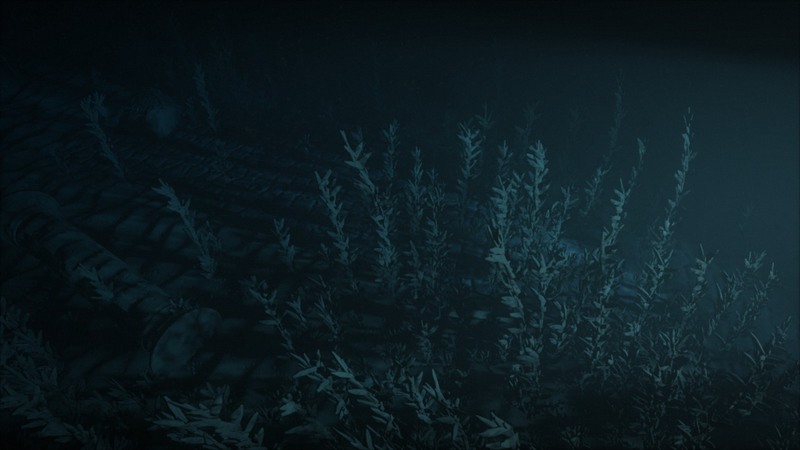 You can read the first part here: A dive into the making of Immersion. When making an animation within only 64kB, using images is tricky. We can’t store them in a traditional way, because it is not efficient enough, even with a compression like JPEG. An alternative solution is procedural generation. It consists in using code to describe how to create the images at runtime. 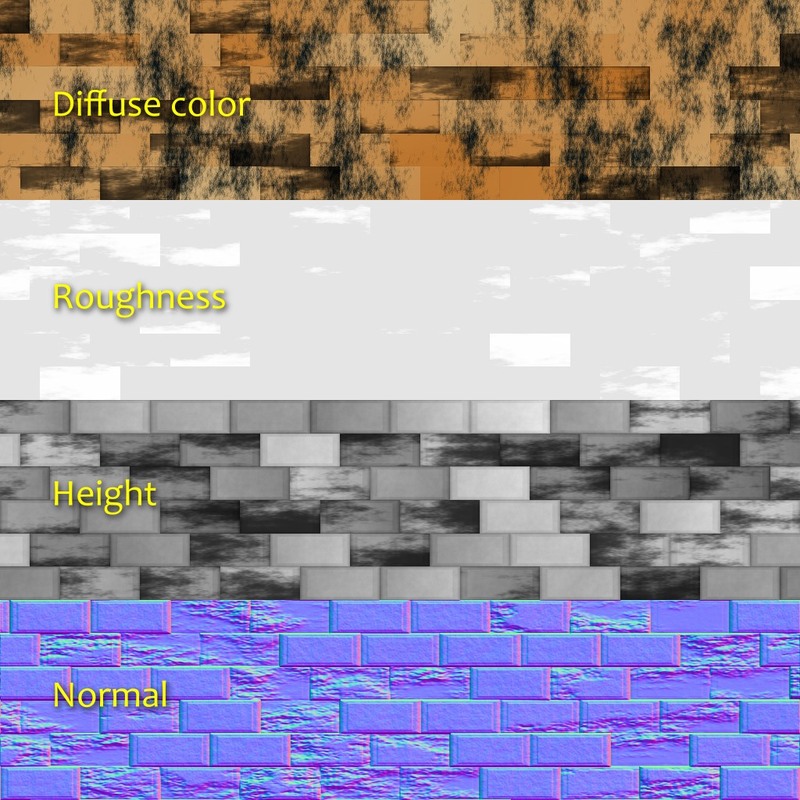 Our implementation of such a solution is the texture generator, a core part of our toolchain. In this post we will present how we designed it and how we used it in H – Immersion. 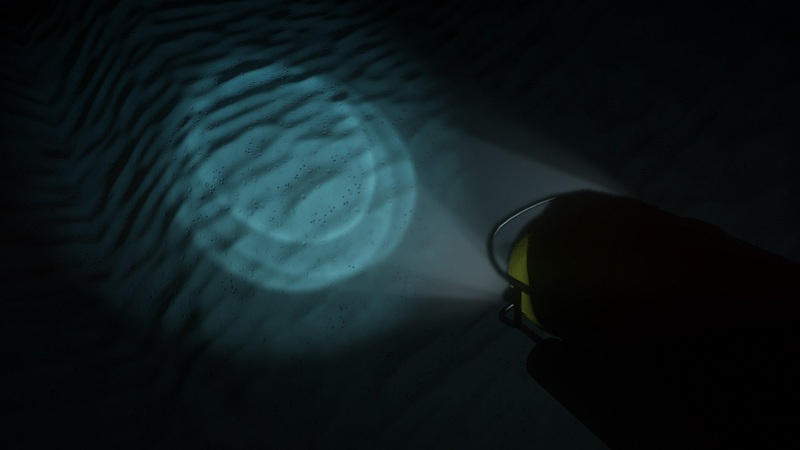 The spotlights of a submersible reveal details of the seafloor. Texture generation has been one of the earliest elements of our code base: our first intro, B – Incubation, already had procedural textures. The code consisted in a set of functions to fill, filter, transform and combine textures, and one big loop to go over all the textures. Those functions were written in plain C++, but were later exposed with a C API so they could be evaluated by a C interpreter, PicoC. At the time, we were using PicoC in an effort to reduce iteration time: in this case it allowed to modify and reload the textures at runtime. Limiting ourselves to the C subset was a small price to pay for the ability to change code and see the result without having to quit, compile and reload the entire demo again. 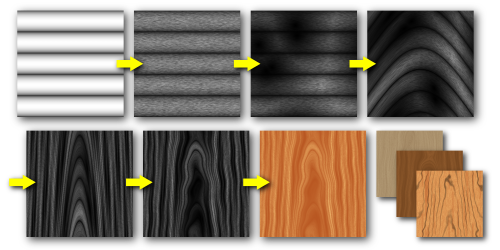 With a simple pattern, some noise and some deformation, we can obtain a stylized wood texture. 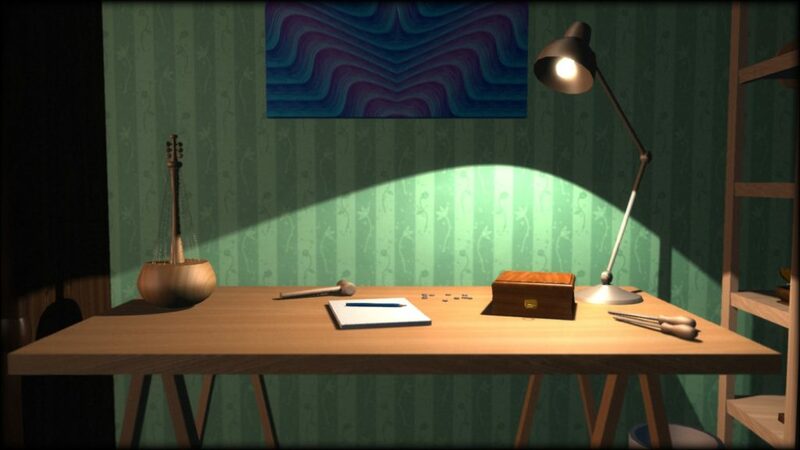 Various wood textures are used in this scene from F – Felix’s workshop. We explored for a while what we could do with that generator, and ended up putting it on a web server with a small PHP script behind a simple web interface. We would write texture code in a text field, the script would feed it to the generator, which would then dump the result as a PNG file for the page to display. Soon enough, we found ourselves doodling from the office during lunch breaks and sharing our little creations among group members. This interaction was very motivating for creativity. 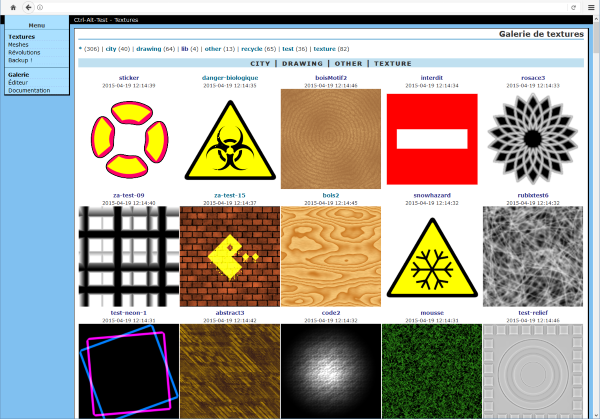 Our old texture generator web gallery. All the textures were editable in the browser. For a long time the texture generator almost didn’t change; we thought it was fine and our efficiency plateaued. Then we woke up one day, and discovered that Internet forums were suddenly full of artists showing off their 100% procedurally generated textures and challenging each other with themes. Procedural content used to be a demoscene thing, but Allegorithmic, ShaderToy and the likes had now made it accessible to the crowd while we had not been paying attention, and they were beating us hard. Unacceptable! It was long due time to reevaluate our tools. Fortunately working with the same texture generator for several years had given us time to understand its flaws. Our nascent mesh generator was also giving us some additional perspective on what we wanted a procedural content pipeline to look like. The most important architecture mistake was the implementation of generation as a set of operations on textures objects. From a high level perspective, it may be a correct way of viewing it, but at the implementation level, having functions like texture.DoSomething() or Combine(textureA, textureB) has severe drawbacks. First, the OOP style requires to declare those functions as part of the API, no matter how simple they are. This is a major problem because it doesn’t scale well and more importantly, it creates friction in the creation process. We don’t want to change the API every time we try something new. It makes experimentation more difficult, and ultimately limits artistic creativity. Second, in terms of performance, it forces to loop over texture data as many times as there are operations. It wouldn’t matter too much if those operations were expensive relative to the cost of accessing large chunks of memory, however that’s usually not the case. Except for a few operations like generating a Perlin noise or doing a flood fill, most are in fact very simple and require few instructions per texture point. This means we keep traversing texture data to do trivial operations, which is ridiculously cache inefficient. The new design addresses those issues with a simple reorganization of the logic. 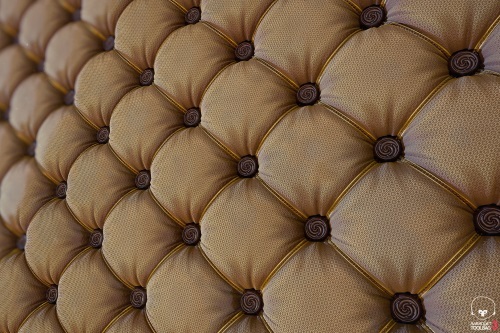 In practice, the majority of the functions just do the same operation for each element of the texture, independently. So instead of writing a function texture.DoSomething() which goes through all the elements, we can write texture.ApplyFunction(f) where f(element) only works on a single texture element. f(element) can then be written ad hoc for a specific texture. This seems to be a minor modification. Yet doing so simplifies the API, makes the generation code more flexible and more expressive, is more cache friendly and trivially parallelizable. Many of you readers will probably recognize this as being essentially… a shader. Although the implementation is still, in fact, C++ code running on the CPU. We also keep the ability to do operations outside of the loop like before, but we only use that option when it is relevant, for example when doing a convolution. // Logic is at the texture level. // The API is bloated. // The API is all there is. // Generation of a texture has many passes. // Logic is usually at the texture element level. // The API is minimal. // Operations are written as needed. // Generation of a texture has a reduced number of passes. // Implementation passed as a parameter. Generating textures takes time, and an obvious candidate for reducing that time is to have parallel code execution. At the very least, it is possible to generate several textures concurrently. This is what we did up to F – Felix’s workshop and it greatly reduced loading time. However, doing so doesn’t shorten generation time where we most want it. Generating a single texture still takes as much time. That affects editing, when we keep reloading the same texture again and again between each modification. It is preferable to parallelize the inner texture generation code instead. Since the code now essentially consists in just one big function applied in a loop to each texel, parallelization becomes very simple and efficient. The cost of experimenting, tweaking and doodling is reduced, and that directly impacts creativity. This illustration is an idea that we explored and abandoned for H – Immersion: a mosaic decoration with orichalcum lining. It is shown here in our live editing tool. In case it isn’t completely clear in the paragraphs above, texture generation is done entirely on the CPU. At this point some of you might be staring at these lines with incredulity and thinking: “But, why?!”. Generating textures on the GPU would seem like the obvious thing to do. For starters it would likely speed up generation by an order of magnitude. So, why? The main reason is that it was a smaller step of redesign to stay on CPU. Moving to GPU would have been more work. It would have required to solve additional problems, new problems we don’t have enough experience with yet. On CPU we had a good understanding of what we wanted and how to fix some of the earlier mistakes. The good news however, is that with the new design it now seems fairly trivial to experiment with GPU side generation as well. In the future, testing combinations of both could be an interesting path to explore. Another limitation of the old design was that a texture was considered to be just an RGB image. If we wanted to generate more information, say, a diffuse texture and a normal texture for a same surface, nothing was preventing us from doing that, but the API wasn’t actively helping either. This takes special importance in the context of Physically Based Shading (PBR). 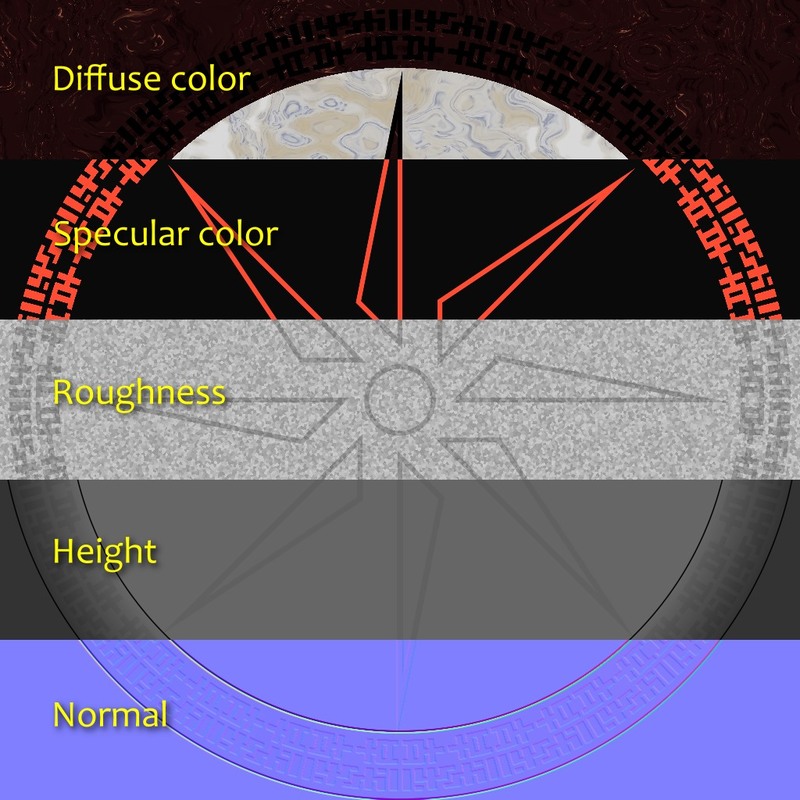 In a traditional non-PBR pipeline, surfaces typically use color textures in which a lot of information is baked. Those textures often represent the final appearance of the surface: they already have some volume, the crevices are darkened, and they may even have some reflection highlights. 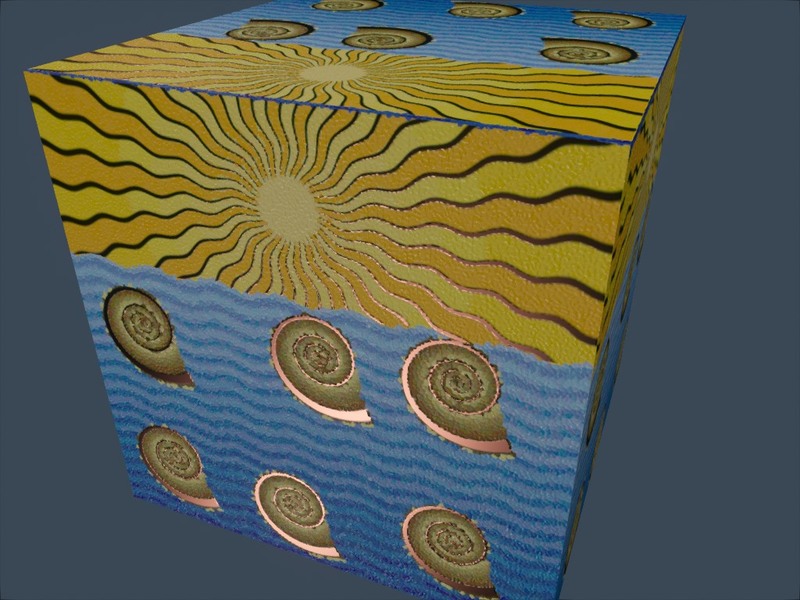 If more than one texture is used at a time, it’s usually to combine details of large and small scale, to add normal mapping, or to represent how reflective the surface is. 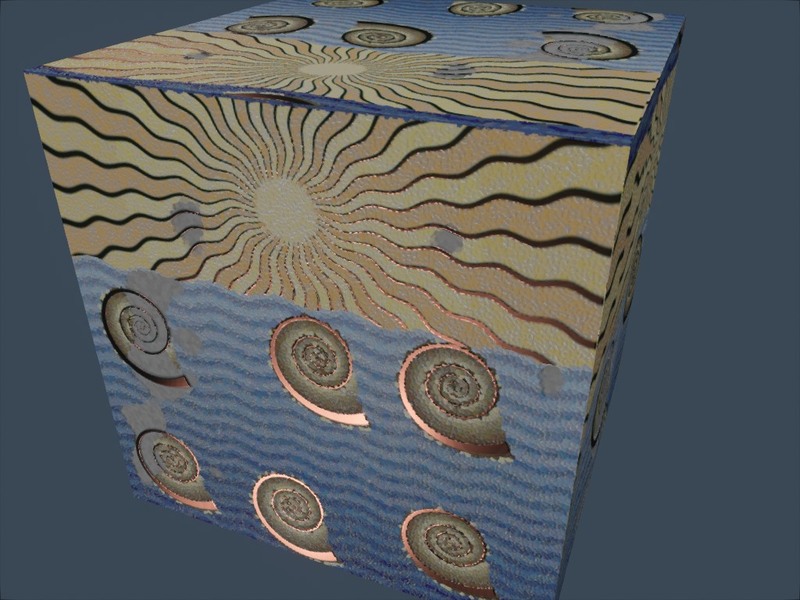 In a PBR pipeline on the contrary, surfaces tend to use sets of different textures that represent physical values rather than a desired artistic result. 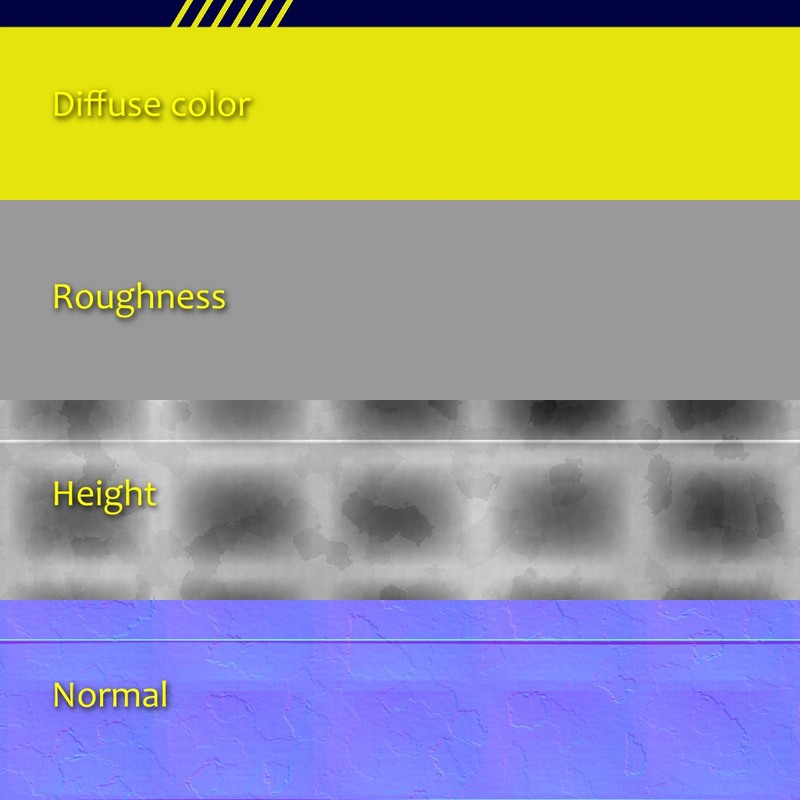 The diffuse color texture, which is the closest to what we commonly describe as “the color” of a surface, typically looks flat and uninteresting. The specular color is dictated by the surface index of refraction. 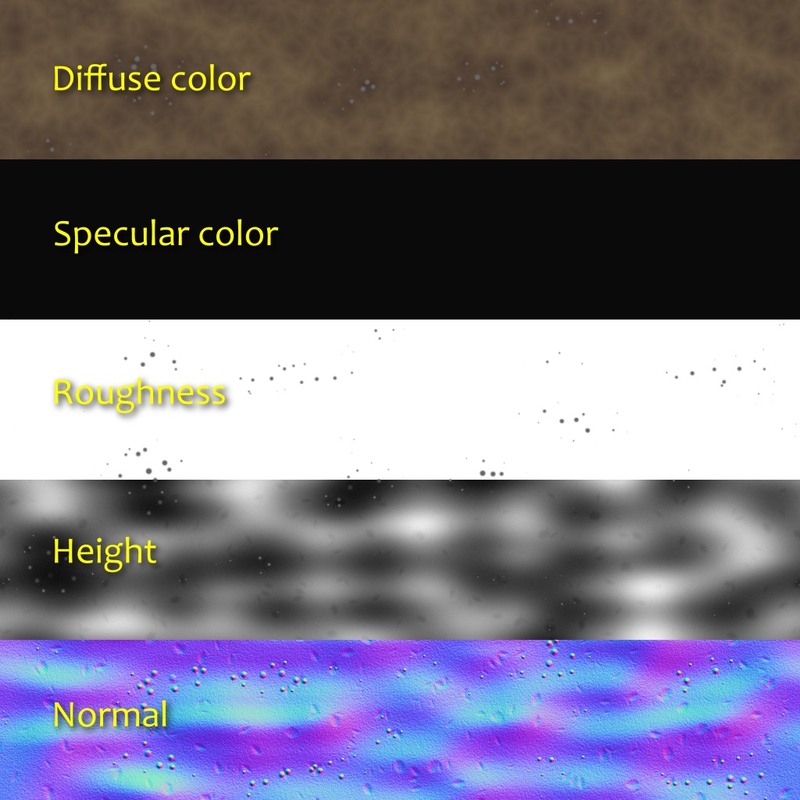 Most of the detail and variety come from the normal and the roughness textures (which you could argue represent the same thing, but at two different scales). How reflective the surface feels just becomes a consequence of the roughness. At this point, it makes sense not to think in terms of textures anymore, but in terms of materials. 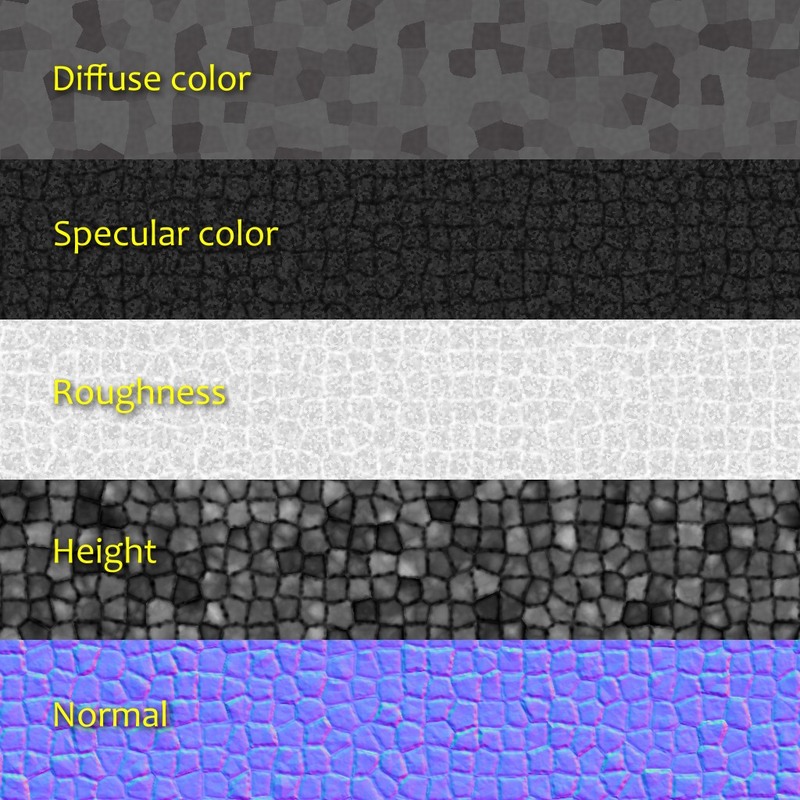 The current design allows to declare arbitrary pixel formats for textures. By making it part of the API, we can have all the boilerplate taken care of. Once the pixel format is declared, we can focus on writing the creative code, without spending additional effort on processing that data. Upon execution, it will generate several textures and upload them to the GPU, transparently. Diffuse color (RGB; 0: Vantablack; 1: fresh snow). Specular color (RGB: proportion of reflected light at 90°, aka. F0 or R0). Roughness (A; 0: perfectly smooth; 1: rubber like). Relief elevation (A; used for parallax occlusion mapping). 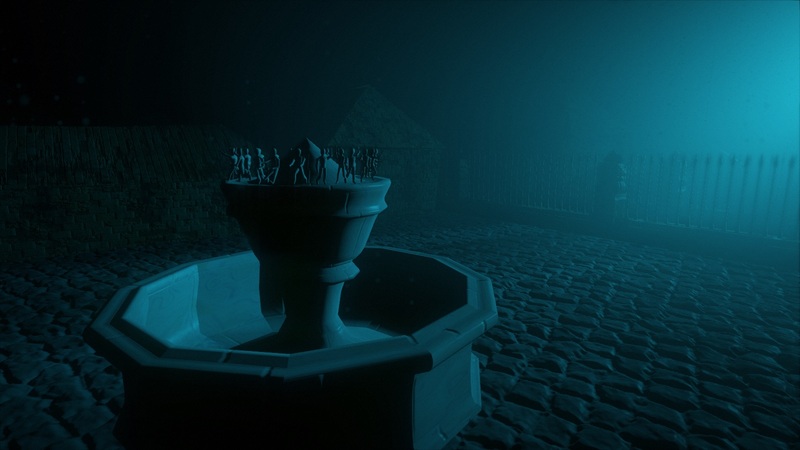 When it was used, emissive detail was added directly in the shader. It didn’t seem necessary to have ambient occlusion either since most scenes didn’t have ambient light at all. It wouldn’t be surprising to have such additional layers though, or other kind of information like anisotropy or opacity for example. 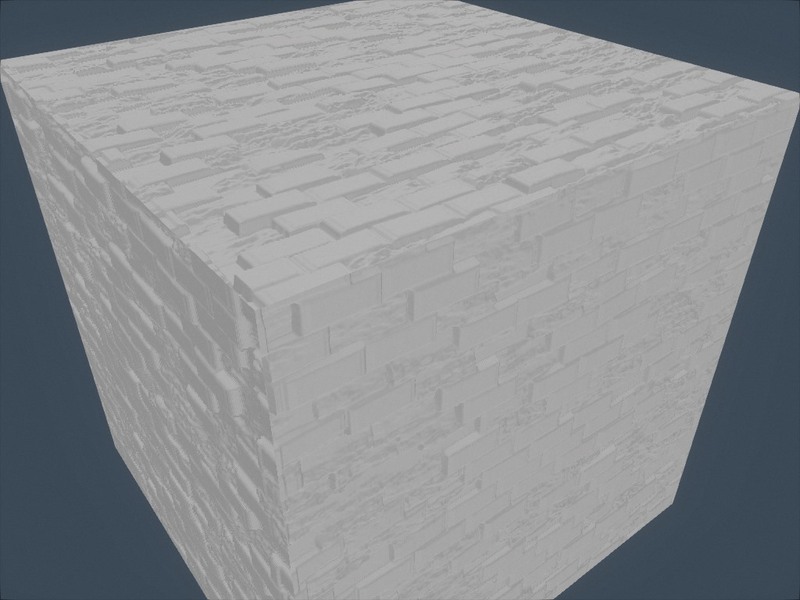 Pictured here is a recent experiment at generating local ambient occlusion based on the height. For each direction, march a given distance and keep the biggest tangent (height difference divided by distance). Finally, compute occlusion from the average tangent. As you can see, the current design is a strong improvement over the previous one, and it provides creative expressivity. However, it still has limitations that we would like to address in the future. For example, although it wasn’t a problem for this intro, we noticed that memory allocation could be an obstacle. The generation of a texture uses a single array of floats. For large textures with many layers, this can quickly hit the point where allocation fails. There are various ways to address this, but they all come with drawbacks. For example we could generate the textures tile by tile, which would scale better, but some operations like convolution would become less straightforward to implement. Finally in this article despite using the word “material”, we have only talked about textures and never about shaders. Yet a material should arguably encompass the shading part as well. This contradiction reflects the limitation of our current design: texture generation and shading are two distinct parts, separated by a bridge. We have tried to make that bridge as simple to cross as possible, but what we really want is to treat the two as a whole. For example, if a material has static features as well as dynamic ones, we want to describe them in a same place. This is a difficult topic and we don’t know yet what could be a good solution but, let’s go one step at a time. 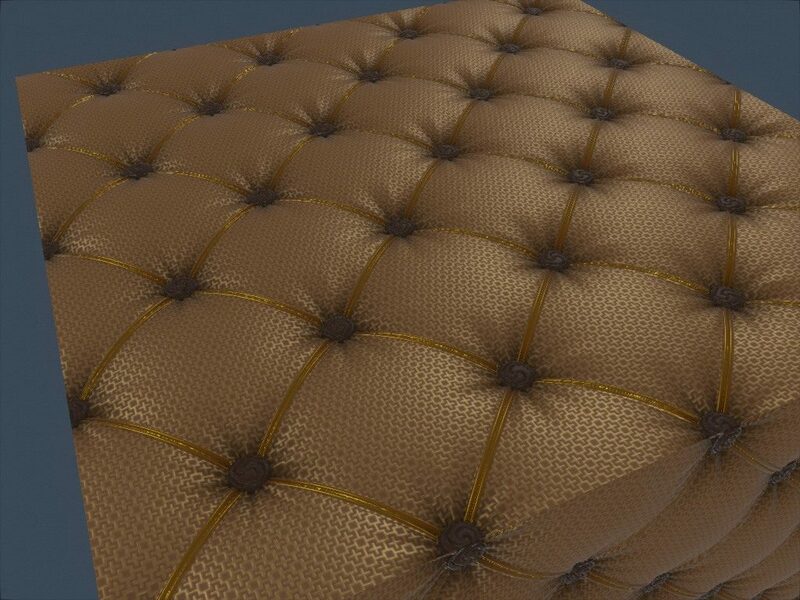 An experiment in trying to create a fabric texture similar to the earlier texture by Imadol Delgado. At last. Last December, we finally finished it. This video here is our last production, a 4 minute animation called “Immersion”. To be more precise, it’s a capture of what is usually referred to as a 64k intro. But more on that later. Making it took the better part of two years’ free time. It all started during Revision 2015, a large event that takes place every year in Germany, during the Easter weekend. The both of us were chatting on our few kilometers long walk from the hotel to the party place, our faces battling the brisk morning air and the sleep deprivation. The previous night, the level of the 64kB competition had been high. Really high. The long established Hungarian group Conspiracy was finally back with a serious bombastic entry. Our best enemy Approximate was perfectly on time for its three years release cycle and showing a great deal of improvement in storytelling. The prolific Mercury now had a mature design style, with a foreshadowing intro title that left no doubt on the showdown. That year, coming empty handed, we were not part of the competition, but we sure wanted to get back as soon as possible. Yet, after such a show we were wondering: slick look, great storytelling, great design… how could we get to that level? I couldn’t see what concept that, even perfectly executed, would have been a clear winner over any of those three. Not to mention that our tech was below any of them. And so there we were, throwing ideas on Hohenzollernstraße, when finally one of them stuck. A city rising out of the sea. That was a concept that, well executed, could maybe stand a chance at competing at the level this subset of that subculture had become. Revision 2016, get ready, here we come! Revision 2016 zoomed past us with a whooshing sound… Revision 2017 it would be then. Alas, we barely made it to this new deadline either. At the party when people asked how it was going, the answer was a witty “It took us a year to make the first half, I’m confident we can make the second half in 24 hours”. We couldn’t. We did release though, but that second half was rushed, and it showed. So much so that we didn’t get even close to the podium. But we worked on it, gave it the love we thought it needed, and at last released the final version shown above. 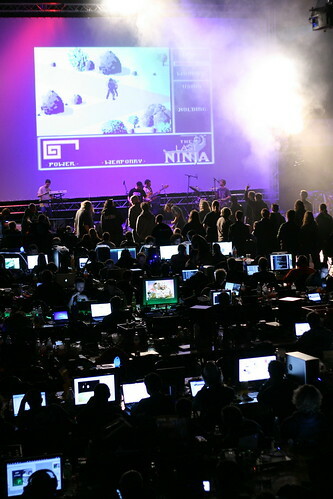 Demos are digital art creations at the crossroad of short films, music videos and video games. Although they present a non interactive experience, often music driven, like a music video does, they are rendered in real-time like video games are. 64kB intros, 64k for short, are like demos but with an added arbitrary limitation on the size: they must fit entirely within a single binary file of no more than 65536 bytes. No extra assets, no network, no extra libraries: the usual rule is that it should run on a freshly installed Windows PC with up to date drivers. But how big is that exactly? Here are some comparison points. Yes, you’ve read that right: that video embedded at the beginning of this post, fits entirely within a single file that takes no more space than a just a screenshot from the video itself. When you see these numbers, it seems complicated to fit in the binary all the images and sounds that surely must be necessary. We talked previously about some of the compromises we make and some of the tricks we use in order to make everything fit within such a small size. But that is not enough. In fact, because of these extreme constraints, usual techniques and tools cannot be used. We wrote our own toolchain instead, a task that is an interesting challenge in itself: we create textures, 3D models, animations, camera paths, music, etc. thanks to algorithms, procedural generation and compression. We’ll talk about those very soon. This chart shows how the 64kB are used by the different type of content, after compression. 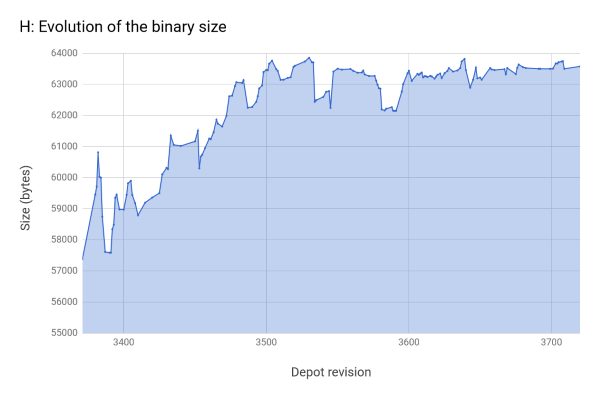 This chart shows how the binary size (excluding ~2kB of depacker) evolved until the final release. 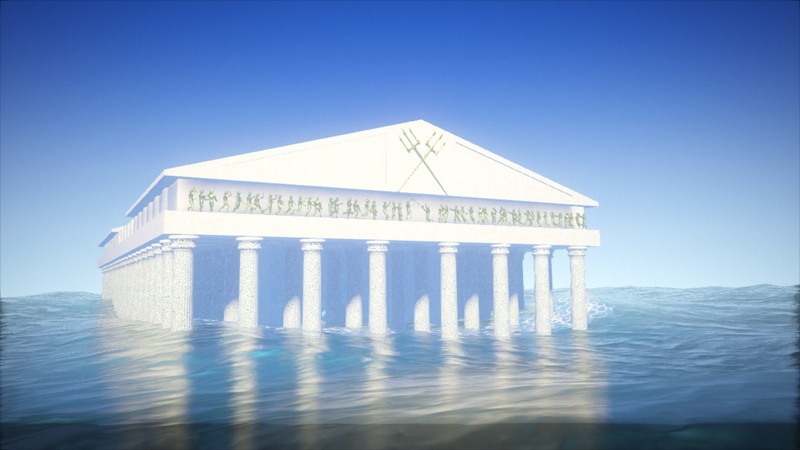 Having agreed that the central theme was a submerged city, one of the early questions was: how was this city going to look? 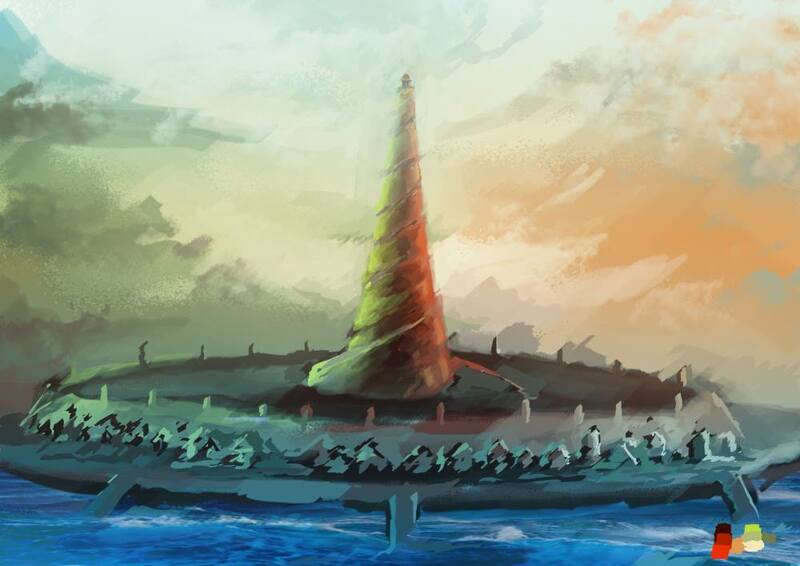 Where was it located, why was it submerged, what was its architecture? 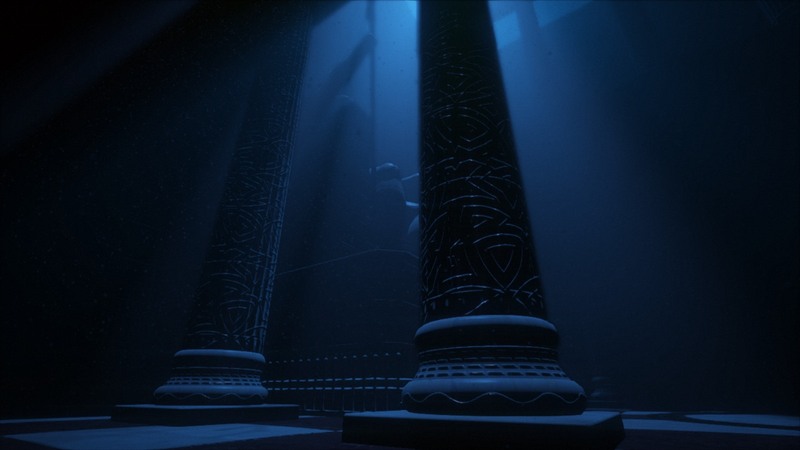 One simple answer addressed all these points: it could be the legendary lost city of Atlantis itself. This would also explain and justify the emergence: by its divine nature (a literal deus ex machina). And thus it was so decided. An early concept art for the emerged city. The artworks shown in this article were created by Benoît Molenda. 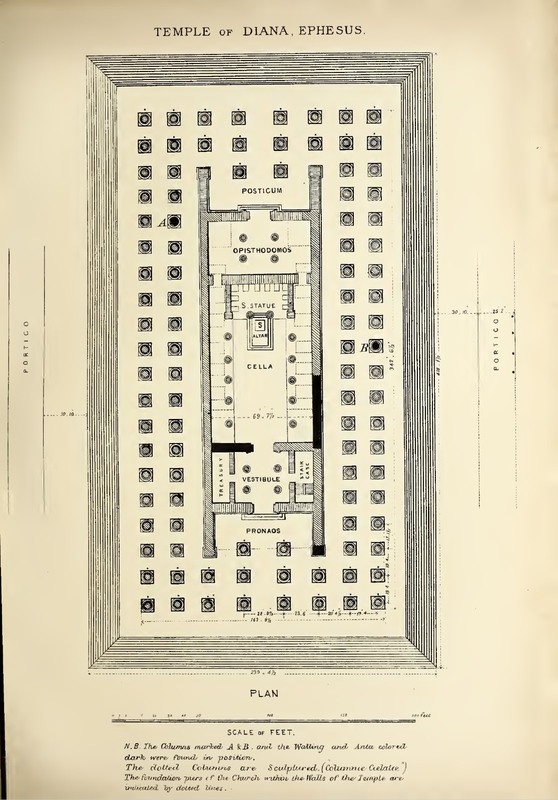 Two books guided our design decisions: Timaeus and Critias, in which Plato describes Atlantis and its fate. 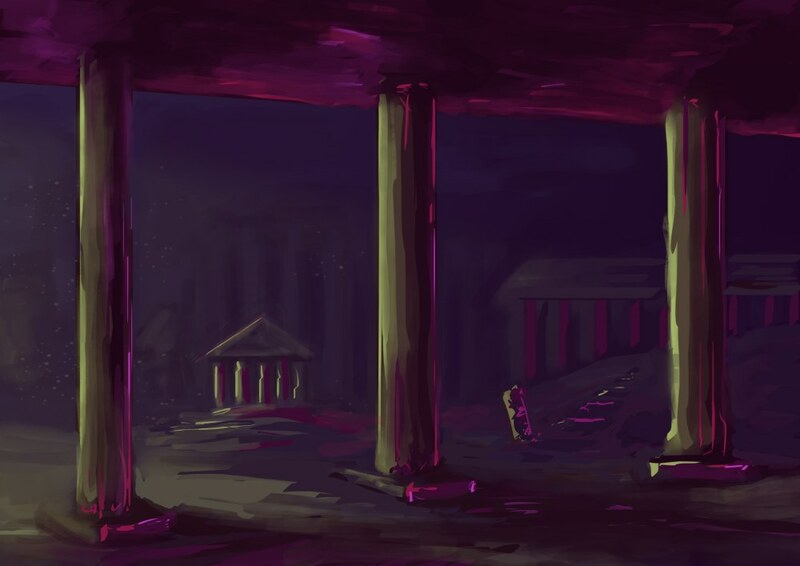 In Critias in particular, he details the structure of the city, its colors, its abundance of the precious orichalcum (which became an essential element in the temple scene), its circular shape, and the main temple dedicated to Poseidon and Cleito. Since Plato apparently based his description on countries he knew, a mix of Greek, Egyptian and Babylonian styles, we decided to stick with these. 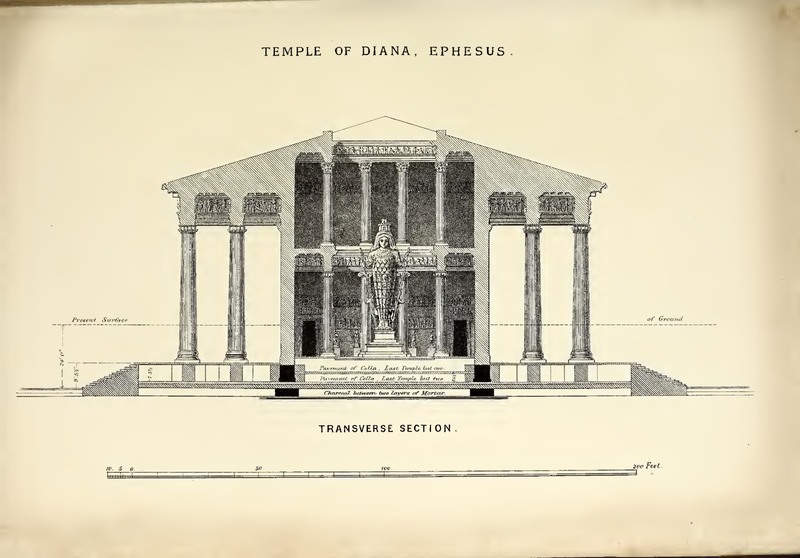 One is a reproduction of the Parthenon at Athens. 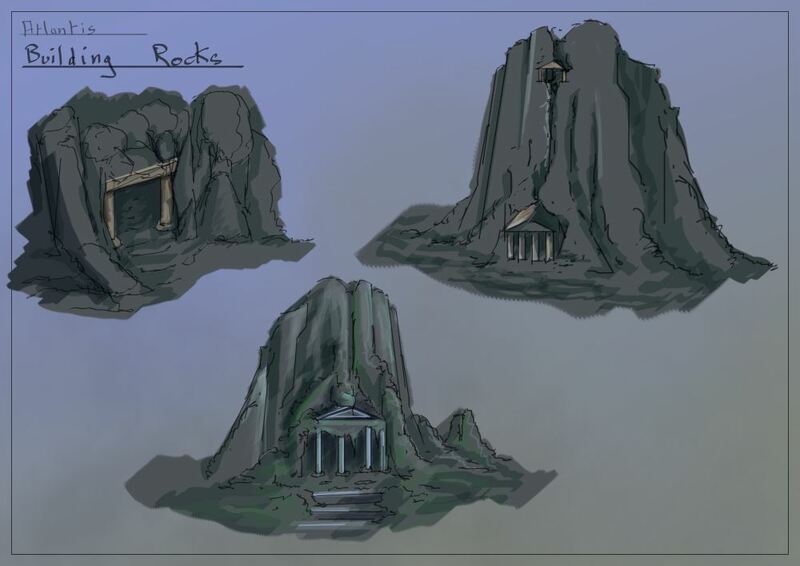 Another one is a simplified version of the Tholos of Delphi. The viaduct is loosely based on the Pont du Gard and the aqueduct of Segovia. 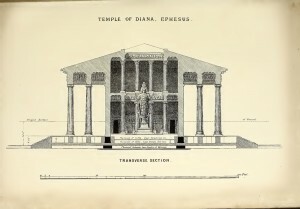 The temple is essentially the Temple of Artemis at Ephesus, one of the Seven Wonders of the antique world. Searching reference material for the Artemision turned out to be an unexpected, enriching experience. 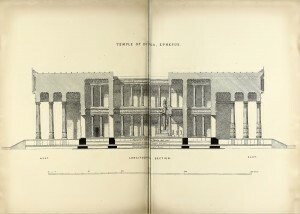 Originally, we were only looking for photographs, schemes or maps for reference. But when we learned about the name “John Turtle Wood”, things took a greater depth. Wood was the very person in charge of the searches and ultimate discovery of the temple location. Hoping that his name would yield better results than merely “Artemision”, we followed up, and we immediately found the book he wrote in 1877, in which he reports not only descriptions and drawings of the temple, but also his eleven years journey to find the lost site, his negotiations with the British Museum to stay funded, his relations with the local workers and the diplomacy involved before randomly digging holes. Those books were essential to the design decision but above all, reading them brought us, as individuals, so much value from making this project. And by the way, how is the roof supposed to look like? Some representations, including Wood’s, have a hole in it and some do not; there is apparently some controversy. 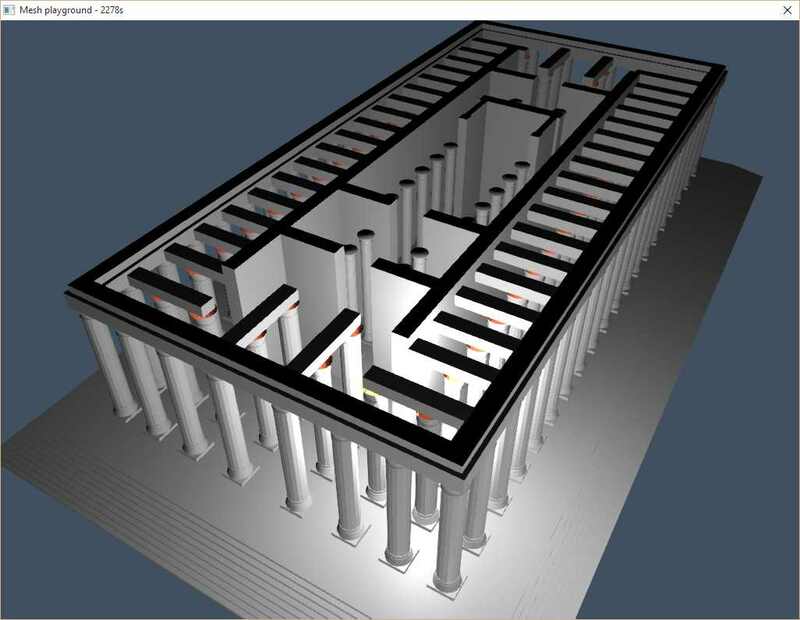 We decided to go with an open roof model, allowing us to reveal the interior of the temple with a beam of light. 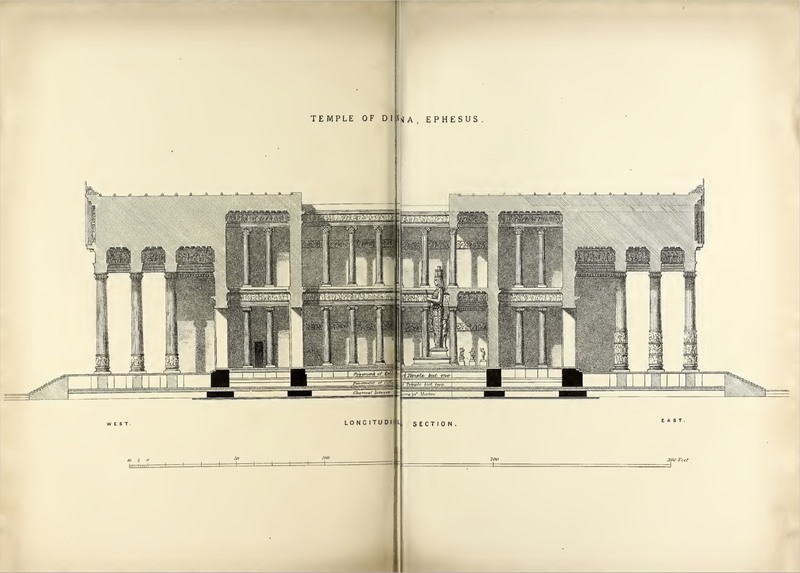 The illustrations above show the floor plan and the cross sections, from the book Discoveries at Ephesus, compared to our work in progress model of the temple. We knew from the beginning that the appearance of water would be crucial to this intro. So we spent a lot of time on it, starting with watching reference material to understand the essential elements of underwater look. You might have guessed inspiration from James Cameron’s The Abyss and Titanic, 3DMark 11, or Ridley Scott’s Blade Runner for lighting. Getting the right look wasn’t about implementing and turning on some epic MakeBeautifulWater() function. 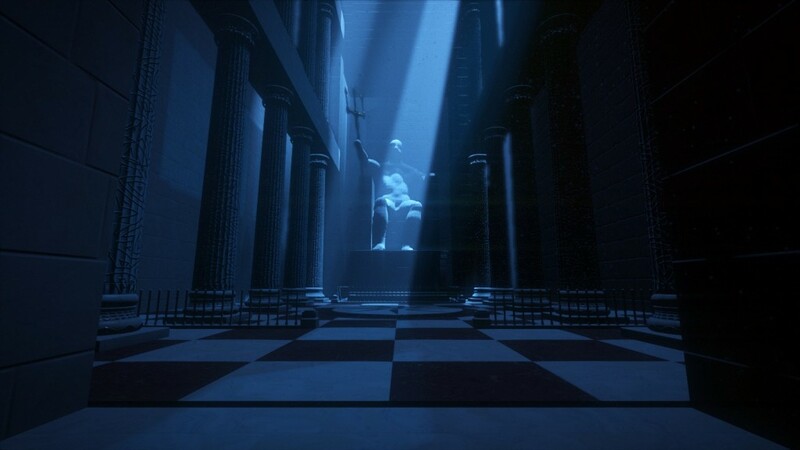 Instead, it was the combination of a series of effects that, when refined, would eventually trick us, the viewer, into accepting the illusion and feeling “This is it, we’re underwater!”. But one mistake, and the deception would collapse; a lesson we learned too late, when comments after the initial release pointed out where the illusion disappeared. As illustrated above we also explored different non-realistic and sometimes extreme palettes, but we didn’t know how to achieve that look so we kept a classic color scheme in the end. The rendering of the water surface assumes a flat plane reflection. Reflection and refraction are first rendered to separate textures, using cameras on one side and the other of the water plane. 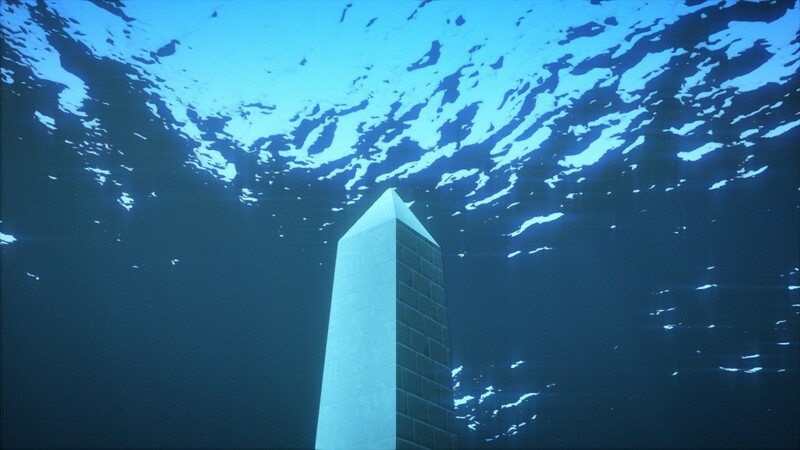 In the main pass, the water surface is rendered as a mesh with a material that combines reflection and refraction based on the normal and the view vector. 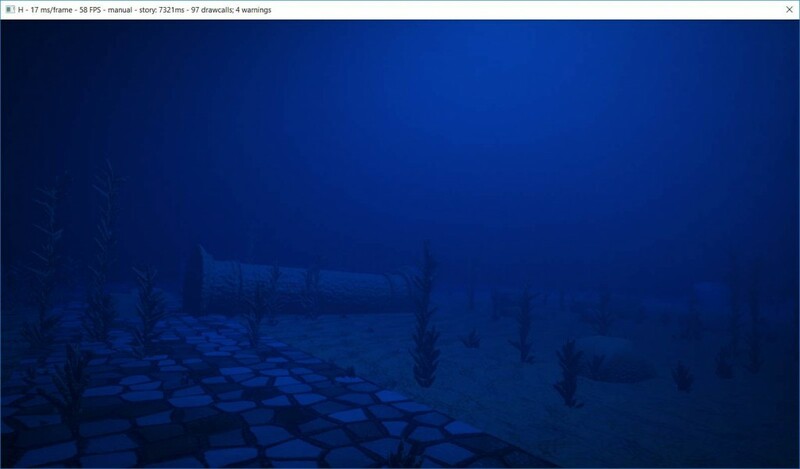 The trick is to offset the texture coordinates based on the water surface normal in screen space. This technique is classic and well documented. It works well at a medium scale like during the boat scene, but at a larger scale like in the final emergence scene, the result looks artificial. To make it believable, an artistic trick we used was to apply a Gaussian blur to the intermediate textures. Blurring the refraction texture gives a murky look to the water, and a greater sense of depth. Blurring the reflection texture helps make the sea look more choppy. Moreover, applying more blur in the vertical direction imitates the vertical trails expected from a water surface. A blurred image of the temple is reflected on the water surface. The animation is done using simple Gerstner waves in the vertex shader, adding 8 of them with random directions and amplitude (within a given range). Smaller scale details are done in the fragment shader, including 16 more wave functions. A fake back-scattering effect based on normal and height brightens the tip of the waves, visible in the image above as small turquoise patches. During the launch scene, a few additional effects are added, like this rain drop shader. “How to make shafts of light for the submersible?” was one of the early technical questions. Maybe a translucent billboard with a beautiful shader could work? One day, we started experimenting with naive ray marching through a medium. We observed with delight that even in an early crude rendering test, and despite coder colors and the lack of a decent phase function, the volumetric lighting was immediately convincing. At that point, that initial billboard idea disappeared, never to be heard of ever again. With this simple technique, effects we didn’t even dare think of where already baked in. As we added the phase function and played with it, it started to feel like the real deal. This opened a lot of possibilities from a cinematography point of view. But then there was performance. 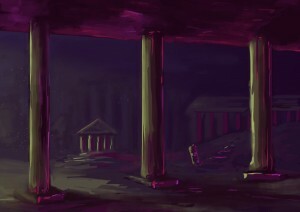 Light shafts give this scene a look inspired by the film Blade Runner. On each pixel, a ray is cast, and its intersections with each light cone are solved analytically. The math is described here (now guess on what occasion the article was written in the first place ;-) ). 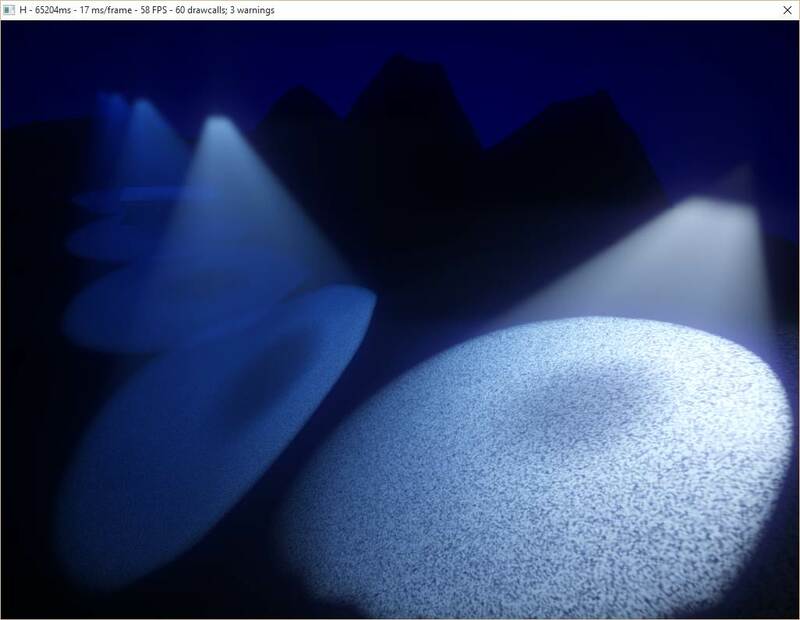 In terms of performance, it would probably be more efficient to use a light volume bounding mesh, but for a 64k it sounded simpler to use an analytic approach. Obviously, rays only go as far as the depth in the depth buffer. In case the ray intersects, the volume inside the cone is then ray marched. The number of steps is limited for performance reason, and they are randomly offset to remove banding. This is a typical case of trading banding for noise, visually less questionable. At each step, the shadow map corresponding to the light is fetched, and light contribution is accumulated according to a simple Henyey – Greenstein phase function. Unlike epipolar coordinates based approaches, using this technique it is possible to have heterogeneous medium density, which adds more variety, but we didn’t implement such an effect. The resulting image is upsampled using a two passes bilateral Gaussian filter and added on top of the main render buffer. 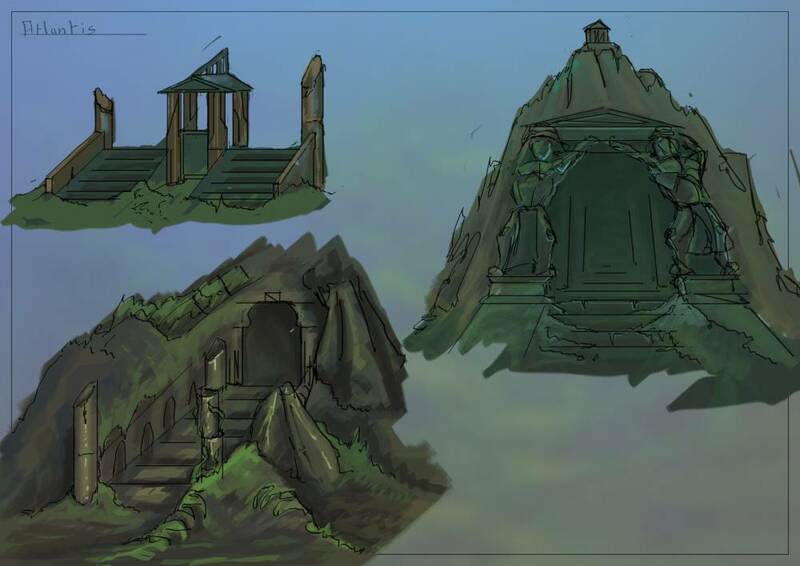 Unlike Sébastien’s tutorial, we don’t use temporal reprojection; we just use a high enough number of steps to reduce visible artifacts (8 steps in low quality settings, 32 steps in high quality settings). Volumetric lighting makes it possible to give a mood and a distinctive cinematic look that would be difficult otherwise. An immediately recognizable aspect of an underwater image is absorption. As objects get distant, they become less and less visible, their colors fading into the background, until they disappear completely. Similarly, the volume affected by light sources is reduced as light is quickly absorbed by the water medium. This effect has great potential for cinematography, and modelling it is simple. It is done with two steps in the shader. A first step applies a simple absorption function to the light intensity when accumulating the lights affecting an object, therefore modifying the light color and intensity when it reaches surfaces. A second step applies the same absorption function to the final color of the object itself, thus modifying the perceived color depending on the distance from the camera. Test of light absorption in the water medium. Notice how color is affected by the distance from the camera and the distance from the light sources. Seaweeds were an element we weren’t certain we could use. 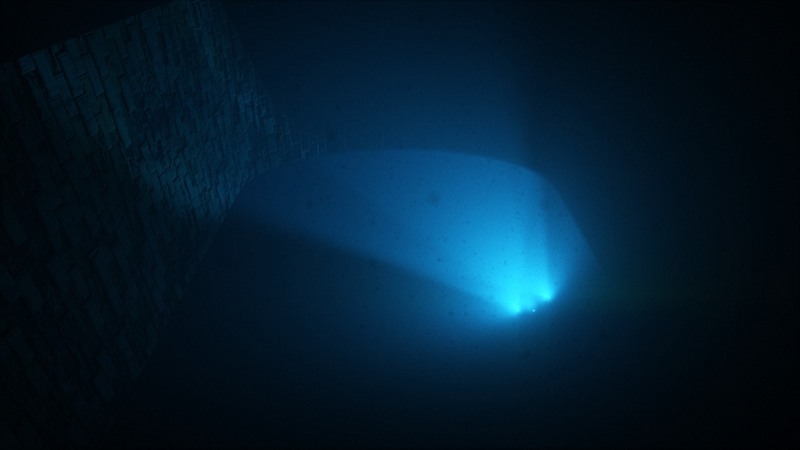 When reviewing the typical features of an underwater scenery, they were sitting among the top elements in the wish list, but their implementation seemed risky. Organic elements like that can be difficult to get right, and getting them wrong could break immersion. They would need to have a believable shape, be well integrated in their environment, and they might even require some subsurface scattering shading model. One day though, we felt inspired to experiment. Starting from a cube, scaling it, and putting a random number of them on a spiral around an imaginary trunk: from far enough it could pass as a long plant with many small branches. After adding a lot of noise to deform the model it was already starting to look half decent. A test shot with a few sparse plants. However as we tried adding those plants to a scene, we realized the performance tanked rapidly with the number of objects. This limited way too much the number of them we could put for the image to look convincing. It turns out our new unoptimized engine was already hitting a first bottleneck. So we implemented a crude ad hoc frustum culling at the last minute (in the final version a proper culling is used :) ), allowing the dense bushes visible in the demo. With appropriate density and sizes (patches with normal distribution), and the details taken care of by the dim lighting, it was starting to look interesting. 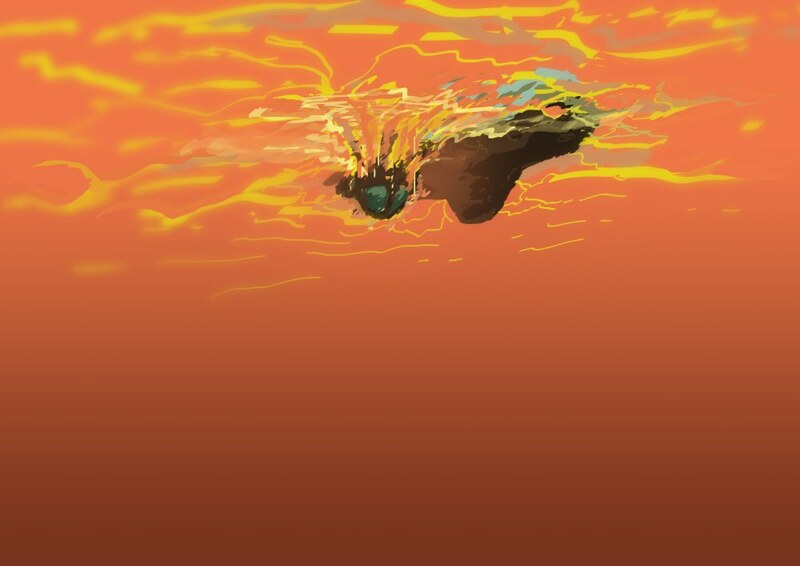 Experimenting more, we tried to animate them: a noise function to modulate the intensity of an imaginary underwater stream, an inverse exponential function to make the plants bend, and a sinus so their tip would swirl in the stream. Doodling some more, we stumbled upon the money shot: the submersible casting a light through the bushes, drawing shadow patterns on the seafloor as it passed off camera. The vegetation casting shadow patterns on the seafloor. Particles are the final subtle touch. 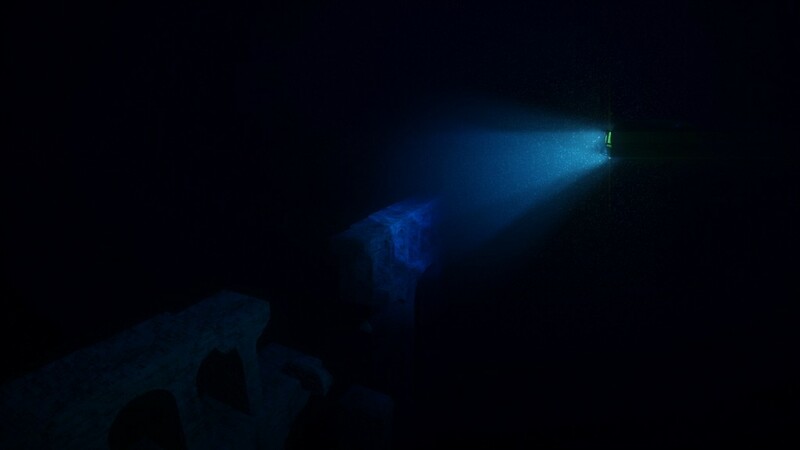 Pay close attention to any real underwater footage and you will notice all sorts of suspended matter. Stop paying attention and it disappears. We tuned particles to be barely noticeable, preventing them from getting in the way. Yet they give a sense of volume filled with a tangible medium, and help sell the look. The technical side is fairly straightforward: in Immersion, particles are just instanced quads with a translucent material. The rendering order problem due to translucency was simply avoided by setting the position along one axis according to the instance id. By doing so, they are always drawn in the correct order along that axis. The particles volume then just has to be oriented properly for each shot. In fact, in many shots this is not even done at all, since the size of the particles and the darkness of the scene made noticeable artifacts rare enough. 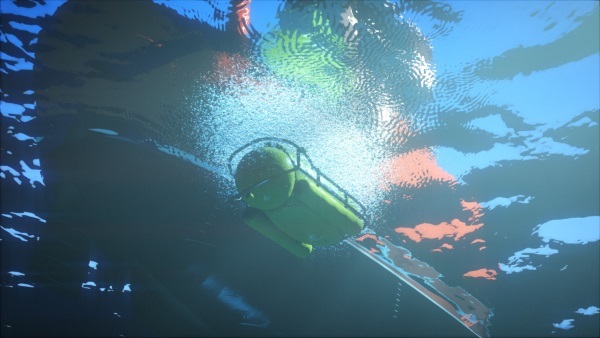 In this shot, particles provide depth cues and a sense of density as the submersible descends. How to fit a high-quality music in around 16kB? This problem is not new, and most 64kB intros written after .the .product in 2000 use the same concepts. The original series of articles is old, but still relevant: The Workings of FR-08’s Sound System. In short, the idea is that we need the music sheet and a list of instruments. Each instrument is a function generating a sound procedurally (see for example Subtractive synthesis and Physical modelling synthesis). The music sheet represents the list of notes and effects to apply. It is stored in a format similar to midi, with some changes to reduce the size. During the execution of the program, the music is generated. The synth has also a plugin version (VSTi) that the musician can use from his favorite tool. Once the music is composed, the musician clicks on a button, which will export all the data to a file. We embed the data in the demo. When the demo is run, it starts a thread to generates the music in a giant buffer. The synth is CPU intensive and is not guaranteed to be real-time. This is why we start the thread before the beginning of the demo, while the textures and other data are generated. Daniel Lindholm composed the music, using the synth 64klang created by Dominik Ries. Iteration time is one of the most critical aspects of the workflow when making a demo. In fact, this is true of many creative processes. Iteration time is king. The faster you can iterate, the more you can experiment, the more variations you can explore, the more you can refine your vision and increase the overall quality. So we want to eliminate as much as possible all the obstacles, all the pauses, all the little frictions in the creation process. Ideally, we want to be able to change anything, any time, and see the result immediately, as a continuous feedback while we are still making the change. A possible solution, used by many demo groups, is to build an editor and create all the content inside the editor. We didn’t. Our initial approach was to write C++ code and do everything inside Visual C++. Over time, we developed a number of techniques to improve the workflow and reduce iteration time. If there was only one single advice to take away from this article, it would be this: make all your data hot reloadable. All of it. Make it so you can detect when the data is changed, load the new data when that happen, and update the state of your program accordingly. One by one, we have made all our data hot loadable. The shaders, the camera, the editing, all the curves that depend on time, etc. In practice, we generally have an editor and the demo running on the side. Whenever we modify a file, the changes are immediately visible in the demo. In a project as small as a demo this is fairly simple to implement. Our engine keeps track of where the data comes from, and a small function checks regularly if the timestamps of the corresponding files have changed. If they do, it triggers a reload of the corresponding data. It might be significantly more involved in a bigger project where such changes are made difficult by complex dependencies and legacy design. But the impact it has on production cannot be overstated, so it is well worth the effort. Reloading data is all well and good, but what about the code itself? This is more complicated and we have approached this problem step by step. The first step was a clever trick that allows to change the constant literals. Joel Davis described it in a post: a short macro that turns a constant into a variable with a piece of code that detects when the source file is modified, and updates the variable accordingly. Obviously in the final binary, this additional code is absent and only the constant is left. The compiler is therefore able to do all optimizations (for example when the constant is set to 0). This trick is limited but it is really simple and can be integrated in the code in a matter of minutes. Moreover, although it is only meant to tweak constants, it can still be used for debugging purposes to modify a code path or toggle features with conditions like if(_TV(1)). Finally our most recent update in our quest to make the code more malleable has been the inclusion of the tool Runtime Compiled C++ in our codebase. By compiling the code as a dynamic library and loading it, as well as doing a bit of serialization juggling, it allows to make changes to that code and see the result at runtime, without restarting the program or, in this case, the demo. This is not perfect yet: the API is intrusive and constrains the design (classes have to derive from an interface), and compiling and reloading the code still take a few seconds. Yet the ability to make changes to the code logic inside the demo and see the result in situation enables a great deal of creativity. At the moment only our texture and mesh generators benefit from it, but in the future we want to extend it to the entirety of the “content” code. Here ends the first part of what will be a series of articles on the techniques used in H – Immersion. We’d like to thank Alan Wolfe for proof reading; you can check his many technical articles on his blog. In the next parts we will present in more details how the textures and the meshes are created. Until then, feel free to ask any question or share your own experience. Part 2: Texturing in a 64kB intro. When the goal is to make a 64kB executable (or less! ), many unexpected issues arise. Floating point numbers are found everywhere: position of objects in the world, position of the camera, constants for the effets, colors in the texture generator, etc. In practice, we often don’t need as much precision as offered by floats. Can we take advantage of that to pack more data in a smaller space? Whether an object is 2.2 or 2.21 meters high, is not meaningful. The goal here is to reduce the amount of space used by those numbers. A float takes 4 bytes (8 bytes for a double). This can be reduced a bit with compression, but when there are thousands of them, it’s still quite big. We can do better. Suppose we have some numbers between 0 and 1000, and we need a 0.1 precision. We could store those numbers as integers between 0 and 10000 and then divide by 10. Whether we use 32 bit or 16 bit integers in the code doesn’t make a difference: since we don’t use their full range of values, all these integers start with leading 0s. The compression code will detect such repetitive 0s and use around 13 bits per number in both cases. The problem with this solution is that we need some processing in the runtime code. Each time we use a number, we have to convert it to a float and divide it by 10. If all our data is in a same place, we can loop over it. But if we have numbers all over our code base, we’ll also need processing code in all those places. This simple operation can be cumbersome and expensive in terms of space. It turns out we can get rid of the processing, and use directly floating point numbers. Floats are stored using the IEEE 754 standard. Some of them have a binary representation that contains lots of 0 and compress better than others. Let’s look at two examples using a binary representation. The IEEE representation is not exactly the same as in the example below (it has to store the exponent), but almost. In fact, 6.3 has no exact representation in base 2: the number stored is an approximation, and it would require an infinite number of digits to represent 6.3. On the other hand, the binary representation for 6.25 is compact and exact. 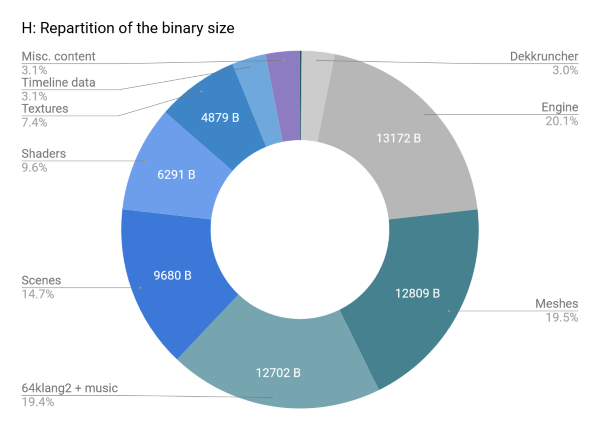 If we’re optimizing for size, we should prefer numbers like 6.25, that have a compact binary representation. For example, 0.125, 0.5, 0.75, 0.875 have at most 3 digits in binary after the decimal mark. The binary representation will have a lot of 0s at the end of the number, which will compress really well. The great thing is that we don’t need processing code anymore because we’re still using standard floats. To better understand IEEE representation, try some tools to visualize the floats. You’ll see how removing the last 1s will reduce the precision. How much precision do we need? Floats are much more precise for values around 0. As our numbers get bigger, we’ll have less and less precision (or we’ll need more bits). 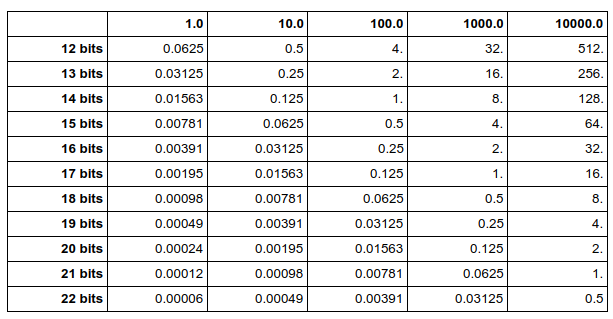 The table below is useful to check how much precision is needed. It tells you the worst error to expect based on the number of bits, and the scale of the input numbers. For example, if the input numbers are around 100 and we use 16 bits per float, the error will be at most 0.25. If we want the error to be less than 0.01, we need 21 bits per float. Of course, each time you add a bit, you divide by two the expected error. An ad hoc solution is to remember this list of numbers and use them in the code when possible: 0.125, 0.25, 0.375, 0.5, 0.625, 0.75, 0.875. An alternative is to use a list of macros from Iñigo Quilez. As Iñigo points out, this is not very elegant. Fortunately, this is hardly a problem because chances are this is not where most of your data lies. 64kB can actually contain a lot of data. Developers often rely on tools and custom editors to quickly modify and iterate on the data. In that case, we can easily use code to truncate the floating point numbers as part of the process. The great thing about this function is that we decide exactly how much precision we want to keep. If we desperately need space at some point, we can try to reduce that number and see what happens. By applying this technique, we’ve managed to save several kilobytes on our 64kB executable. After months of polishing, we’ve finally released the final version of our latest 64kB intro: H – Immersion. You can read the details, download the binary or just watch the captured video from the production page. We’re also currently doing a write up to show some of the techniques involved in this intro, which we’re hoping to publish here soon. How can demoscene productions be so small? People not familiar with the demoscene often ask us how it works. How is it possible that a 64kB file contain so much? It can seem magical, since a typical music compressed as mp3 can be 100 times as big as our animations – not to mention the graphics. People also ask why other programs or games are getting so big. In 1990, when games had to fit on one or two floppy disks, they used only 1 or 2MB (which is still 20 times as much as our 64kB intros). Modern games now use 10-100 GB. The reason for that is simple: Software engineering is all about making trade-offs. The typical trade-off is to use more memory to improve performance. But when you write a program, there are many more dimensions to consider. If you optimize on one dimension, you might lose on the other fronts. We make optimizations and trade-offs that wouldn’t make any sense outside the demoscene. First, we optimize all the data we store in the binary. We use JSON files during the development for convenience, but then we generate compact C++ files to embed in the binary. This saves us a few kilobytes. Is it worth doing it? If you had to make a demo without the 64kB limit, you wouldn’t waste time on this. You’d prefer the 70kB executable instead. It’s almost the same. 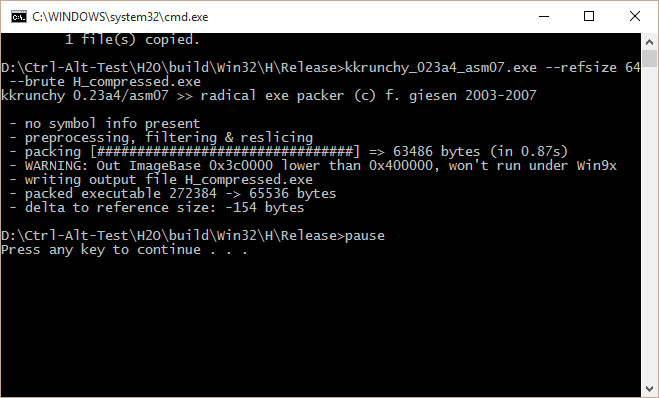 Then, we compress our file (kkrunchy for 64kB intros, crinkler for 4kB intros). Compression slows down the startup time and antivirus software may complain about the file. It’s generally not a good deal. I bet you’ll choose the 300kB file instead. It’s still small, right? We use compiler optimizations that will slightly slow down the execution to save bytes. That’s not what most users want. We disable language features like C++ exceptions, we give up object oriented programming (no inheritance) and we avoid external libraries – including the STL. This is a bad trade-off for most developers, because this slows down the development. Instead of rewriting existing functions, you’ll prefer the 600kB file. Our music is computed in real-time (more precisely, we start a separate thread that fills the audio buffer). This means that our musician has to use a special synth and cannot use his favorite instruments. That’s a huge constraint that very few musicians would accept outside the demoscene. They will send you a mp3 file instead. You also need a mp3 player, and your demo is now 10MB. Similarly, we generate all textures procedurally. And all the 3D models. For that, we write code and this is a lot of work. This adds a huge constraint on what we do (but constraints are fun and make us more creative). 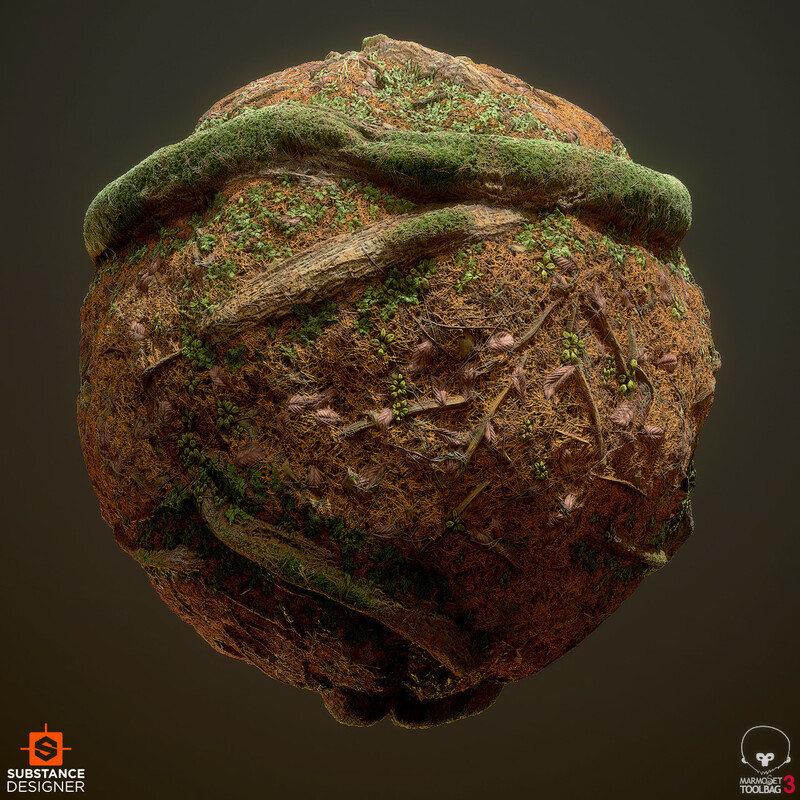 While procedural texture have lots of benefits, your graphists will prefer using their normal tools. You get JPEG images and – even if you’re careful – your demo size increases to 20MB. At this point, you may wonder if it makes sense to write your own engine. It’s hard, error-prone and other people probably made one better than you would. You could use an existing engine and it would add at least 50MB. Of course, it’s still a simple application made by a small team, you can imagine what happens when you scale this up to a full game studio. So demosceners achieve very small executable sizes because we care deeply about it. In many regards, demoscene works are an art form. We make decisions meant to support the artistic traits we’re pursuing. In this case, we’re willing to give up development velocity, flexibility, loading time, and a lot of potential content to fit everything in 64kB. Is it worth it? No idea, but it’s a lot of fun. You should try it. It’s been 4 years since the last message here. Sorry about that. G – Level One was released at Tokyo Demofest 2014 and got the 1st place. One year later, we made a final version. We released H – Immersion last week at Revision. It ranked 5th (out of 10). If you haven’t seen them, you should check the other prods of the competition. We’ve put the source of Felix’s Workshop on github. We’re working on a final version for Immersion. Sorry that the party version was not polished enough. I’d like to write a detailed making-of article for Immersion. We’re going to update Shader Minifier. This is the breaking news that crashed into our mailboxes yesterday. The PC 64kB Intro we released last year at Revision, F – Felix’s workshop, has been selected to be shown at SIGGRAPH 2013 as part of the Real-Time Live! demoscene reel event. Unfortunately we won’t be able to attend SIGGRAPH this year, but to have our work there is quite some awesome news.